My first article "The sum of all fears" has been published in the Butler Group Review - it's a review of the underlying processes behind web 2.0. Obviously I'm delighted and hopefully my second article will also be out soon. Anyway, I thought I'd take some time to write a little more about the book I'm writing on understanding your landscape, coherence and its origin. It all stems from conflicts which I'd noticed in the business world. Be lean and mean but yet be a great company to work for; be innovative and high speed but plan in detail; create value but focus on cost. Combine this with concerns over aligning to the business strategy and most organisations seem fairly schizophrenic (multiple changing and overriding personality types) or at least bipolar (mood swings between extremes). Let's look at the business strategy first. Most business strategies to me are very noticeable for what they miss out rather than what they include. Any business is a mass of potential competitive advantage (CA), transitional and cost of doing business (CODB) activities. However most business strategies emphasise the differential, the competitive advantage whereas the cost of doing business is often diminished. Now let's bring that skewed strategy down to the level of a function such as IT. As said before a function is a mass of connected activities (products and processes) with each activity at its own stage of its own S-Curve of evolution between idea and ubiquity, from novel and new to commonplace, from uncertain to certain, from undefined to defined, from dynamic to static and from barely repeatable to easily repeatable. Most organisational functions seem completely unaware of what stage of evolution their activities are at, even assuming they are fully aware of what activities they do or what their users actually need in the first place. Most functions would have a hard time splitting their activities into potential CA / Transitional and CODB. As any activity moves through its S-Curve then the characteristics of that activity change and the methodologies, culture, finance and governance needed to manage that activity change as well. Most organisations seem unaware of this and manage by function rather than by stage of evolution. You have a situation in which you have lots of activities (which you may or may not be fully aware of) that you are often trying to manage with the wrong methods (as you are unaware of stage and how to govern by stage) in order to fit in with a skewed business strategy (which ignores most of what you do and what your user might need) whilst dealing with a bewildering array of trends from the outside environment for which no-one ever seems to give you a straight answer (as neither you nor anyone else is in a position to say what the effect is on your organisation without knowing the above). Each time I read that paragraph, I feel shudders of arrogance and a dreadful feeling that I'm getting it all wrong. There are lots of smart people out there, lots of good business schools, lots of great thinkers but I keep feeling like the kid pointing at the naked emperor or the villager shouting "he's the werewolf!" Now, I've been poring through the history books and every time I have come across a company which has moved away from a functional organisational design to one based around the evolutionary stage of activity - it has had dramatic positive effects. Unfortunately, this move has always been coincidental to some other activity and organisations have tended to lapse back into a functional approach over time. The more I research I do, the more evidence I gather. I am now more convinced than ever that the issues surrounding corporate innovation, outsourcing, alignment with business strategy and a host of other conflicts are all primarily due to a monumental howler in organisational design. 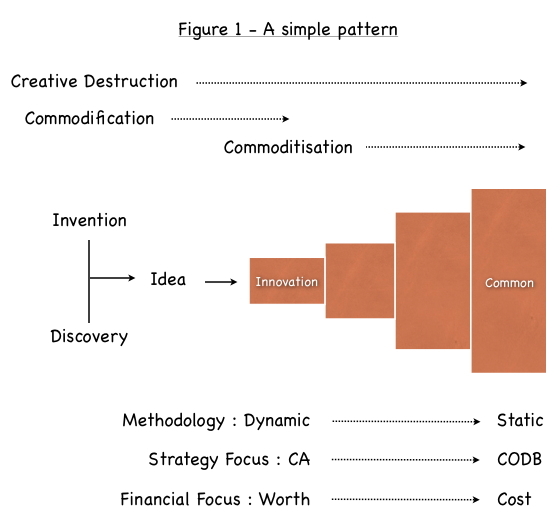 "Innovations are dynamic problems and require dynamic methodologies such as agile development and a more worth focused VC-like approach to financing. By contrast, the use of utility services requires a focus on cost, standards and static methodologies. Unless you intend to stop innovating and give up on the long term source of profit for any organisation, then the IT department must find a way to manage both of these extremes. As commoditisation is ongoing, you’ll also need to continuously deal with the transition between these two extremes." I have the advantage that I've lived and breathed in an organisation that was designed around these three different stages of evolution. In fact, I was the one who re-organised the company. However, I'm no werewolf and I'm no seer - I just like history books - and so what worked for me may not work for you. But there isn't one idea in the above list whose origin can't be traced back over thirty years ago and yet we keep on repeating the same old problems. SaaS and OSS a natural fit. Gartner calls for more duck friendly IT. Market or Lock-in? You decide. Interesting news .... comes in threes.